This is a new twist on finding text evidence activities. My students struggle with reading and following directions. it can be challenging to even get them into the habit of consistently reading the directions when they are working independently (and boy, it this evident in their homework!). Throughout the year, we do a lot of practice with reading directions, because really, this is a whole new level of reading. Students learn to look for clues in the text as well as to answer the question, "What am I being asked to do?". What better way to hone this skill than by giving them directions in an area that is sure to be high interest! 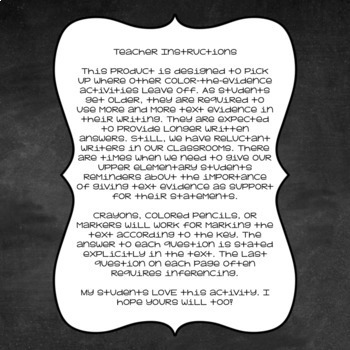 This product is designed to pick up where other color-coded text evidence activities leave off. As students get older, they are using more and more of their evidence in their writing. They are expected to provide longer written answers. Still, we have reluctant writers in our classrooms. We have times when we need to give our upper elementary students a reminder about the importance of providing text evidence as support for their statements. I have used this activity as bell work, homework, and this year, I have also sent it home as part of my students' ELA summer work requirements. This particular packet will be the one I use to introduce finding text evidence in the late fall. 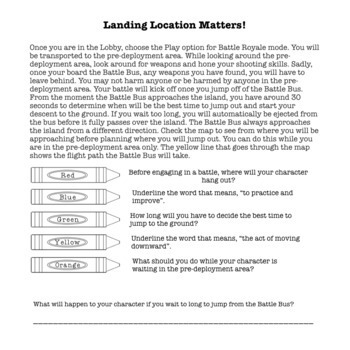 This packet highlights 15 sets of directions to make your students more successful at Fortnite (I know, I know...not a priority to you...but maybe a priority to your students?). This is the FULL BUNDLE. 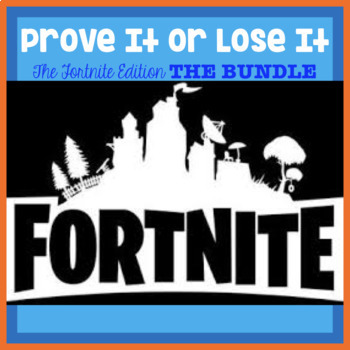 All four previous Fortnite editions are included in this bundle, so you get 60 passages! After completing the reading, finding the text evidence, and completing the vocabulary challenges, students can actually follow the directions and put the tips to use themselves in order to provide an authentic assessment. Please message with any questions. Don't forget to leave feedback and earn your TPT credits...it's like free money!